Mont-Azul was traditionally used by the nomadic mongrel men peoples of the region for religious ceremonies. There was no permanent settlement, but a stable population was maintained in the region throughout the year. Following colonialisation, the region became a profitable farming region owing to the rich soils surrounding the mountain and its location along the trade route between Cen Tea Ven and the nations to the west. During this early period of farming, the mountain itself was thoroughly explored and mapped by Charlize Chartson, the prolific spelunker and adventurer. Her husband, Huxle Swan was a biologist, and reconised the potential for growing crops within the caves by utilising the native phosphorecent mosses and fungus. The couple settled down, established a series of vineyards within the mountain and established the tourist economy that Mont-Azul is now famous for. Mont-Azul became a popular tourist destination, primarily catering for weddings and honeymoons. This focus was brought about deliberately by the local council who saw the lucrative profits that could be made from visiting families from Cen Tea Ven. At an unknown point in time however, the town had been taken over by a shape shifting monster who devised a plan that reaped huge profits for the townspeople and a limitless supply of human flesh for his own consumption. Wedding parties who would arrive al the town would be slaughtered, and stripped of all their possessions, gifts, carriages and wealth. The bodies would be used as feed for the shape shifter, and an entire industry was built around altering stolen property so it was unrecognisable and then selling it westward, or over seas. Because entire families, extended and all were consumed in this process, there was no one left to recognise their disappearance. This scheme was uncovered by an unlikely band of heros who were in the village to celebrate the marriage of Haroldo and his fiance Brinia. 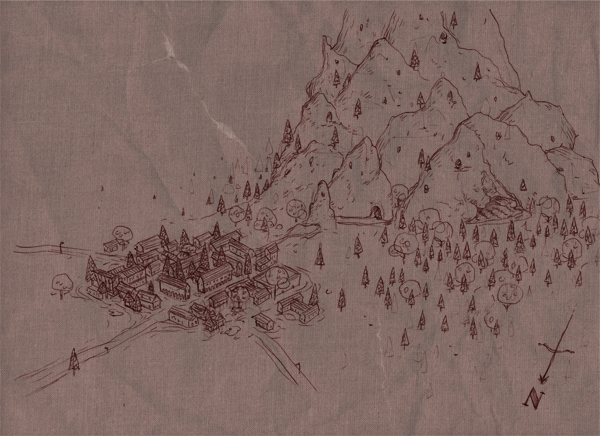 The resulting conflict saw the shape shifter defeated and the entire village of Mont-Azul massacred. The village is currently closed for visitors, although the true nature of the reasons behind this closure are not public knowledge.